Doctor Who returned after a Christmas break with the second part of its current season and an opening story that introduced the new companion. I could be talking about 2013 but it might surprise some people to know that we were having split seasons back in the mid-1970s. The first story of the year was 'The Face of Evil' which introduced new girl, Leela. Leela was quite a departure from the past few companions. Rather than being from contemporary Earth she's a warrior woman from the future (descended from space travellers stranded on a distant planet), dresses in animal skins and carries a big knife. Despite appearances, though, she's not a simple savage. She's bright and inquisitive and it's these traits that get her involved with the Doctor in the first place. Leela's one flaw is that she has no problem with killing her opponents when necessary. If she's not using that big knife of hers then it's the Janis thorn, part of a poisonous plant which causes paralysis and eventually death. It's a character trait that leads her into conflict not only with the Doctor but with critics of the TV series like moral crusader Mary Whitehouse. 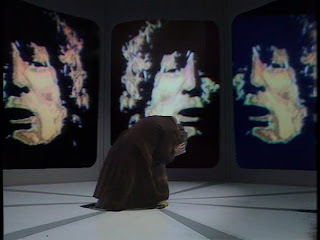 As for the titular 'Face of Evil' itself: well the Doctor learns first hand about the negative consequences of his interference as it turns out that he's responsible for Leela and her people's current situation and that the face of evil is in fact his own. 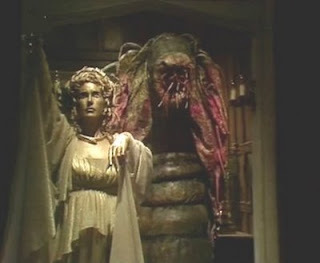 Leela chooses to join the Doctor in his travels at the end of the story. This in itself marks Leela out as a bit different from most other companions - usually they're invited into the TARDIS by the Doctor, here Leela makes the decision herself. 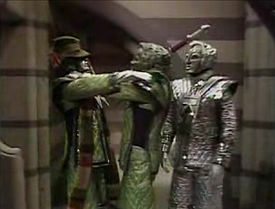 'The Robots of Death' is the next story and, I'll admit now, that it's one of my all time favourite stories and one that I've long thought to be overlooked and underrated. The story is essentially a good old-fashioned whodunit in true Agatha Christie style where everyone is a suspect. Unlike an Agatha Christie novel though the murder weapons are the robots that are being sent out by someone to commit the murders. There's a lot of great scenes in this story but one of my favourites is this scene, where the Doctor for the first time actually tries to explain why the TARDIS is bigger on the inside. I particularly like Leela's reaction at the end. 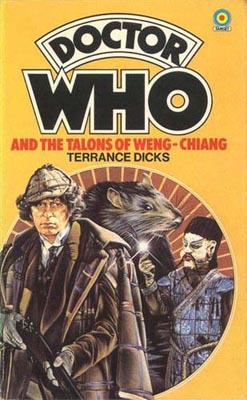 If there's one reason why 'Robots of Death' is overlooked it might be that it's followed by 'The Talons of Weng Chiang', a story that is widely considered to be one of the very best in the series' history. Set in late-Victorian London, this story takes its inspiration from, amongst other things, Sherlock Holmes, Jack the Ripper, Fu Manchu and the Phantom of the Opera as it sees the Doctor and Leela investigate a series of strange murders in the East End of the city. Their investigation lead them to the cellars of the Palace Theatre where they discover the individual organising the murders: someone calling themselves the Chinese god Weng Chiang. This being Doctor Who, nothing is quite as it seems. Weng Chiang isn't really a Chinese god but a time-travelling war criminal from the future and the ventriloquist's puppet that he sends out to commit murder is really a robot with the brain of a pig. 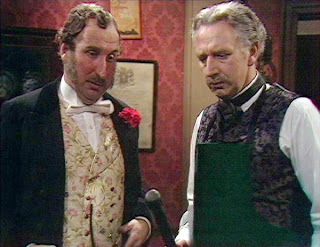 Not surprisingly, this is quite a dark tale - literally in some cases - but something that does lighten the mood somewhat is the introduction of two characters to assist the Doctor and Leela in their investigations: Professor George Litefoot, police pathologist, and Henry Gordon Jago, the exuberant manager of the Palace Theatre where much of the story takes place. The two characters are a great double act and proved so popular that, for years afterwards, fans were requesting that the two characters be given their own spin-off series. Many, many years later their requests would finally be answered but that's another story. The day after the final episode of 'Talons of Weng Chiang' was shown, BBC2 broadcast a documentary called 'Whose Doctor Who'. It was the first time that an entire documentary had been made about the series. 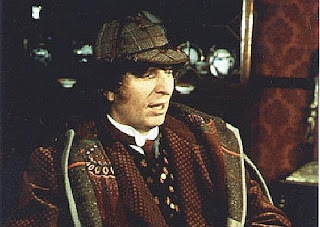 Presented by Melvyn Bragg, it looked at the history of the series, its popularity and also looked behind the scenes at the making of Talons of Weng Chiang. 'Talons of Weng Chiang' was the end of Doctor Who's fourteenth season and, behind the scenes, things were changing. In light of the many complaints that they were receiving regarding the frightening nature of the series, the BBC chose to move producer Phillip Hinchcliffe on to another programme. He was replaced by Graham Williams who was asked to lighten the series up and make it less frightening. 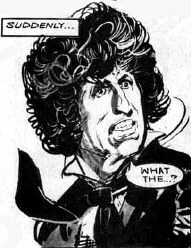 The first story when Doctor Who returned after its summer break was 'Horror of Fang Rock' which is still very much in the vein of the 'Gothic' style stories of the previous season and doesn't really give much indication of the horror being toned down. If anything the opposite seems to be true here. 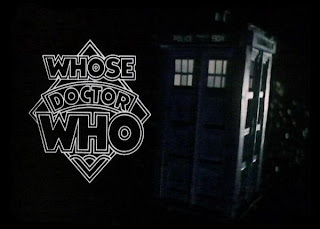 Set in a remote lighthouse at the turn of the 20th Century, the story sees the Doctor and Leela trapped in the lighthouse with a small group of people while something goes around killing them one by one. What is particularly notable about this story (other than the high body count) is that the monster featured here is one that has been mentioned in earlier stories but never seen until now: the Rutan. The Rutan are jellyfish-type aliens that have the ability to shape-shift. They've been at war with the Sontarans for many years and were referred to in both of the previous Sontaran stories, 'The Time Warrior' and 'The Sontaran Experiment'. The next story, 'The Invisible Enemy' takes the Doctor and Leela in the future where the Doctor becomes infected with a strange virus. 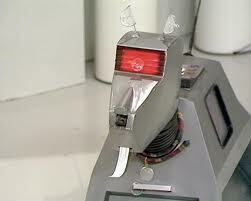 Leela takes him to a hospital where they encounter one Doctor Marius and his pet robot dog, K9. Yes, this is the story where we first encounter Doctor Who's answer to R2D2 and C3PO. 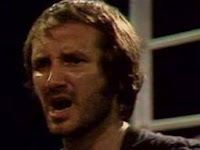 He was originally intended to appear in just this one story but, in order to ensure that they made the most of the expensive prop, the production team decided to add him to the regular cast. It was a wise move. Not only did it lighten the tone of the series but K9 also provided a lucrative form of merchandise in years to come as his popularity grew and grew. It's also provided K9 voice, John Leeson with regular work for the past 35 years. The decision to add K9 to the TARDIS crew was taken late in the day so he only appears briefly in the next story 'Image of the Fendahl'. This is perhaps just as well as this story is certainly darker in tone than 'The Invisible Enemy' and K9 would have seemed out of place. Indeed, so dark is this story that one character even commits suicide by shooting themselves rather than be killed by the alien Fendahl who feed off life itself. 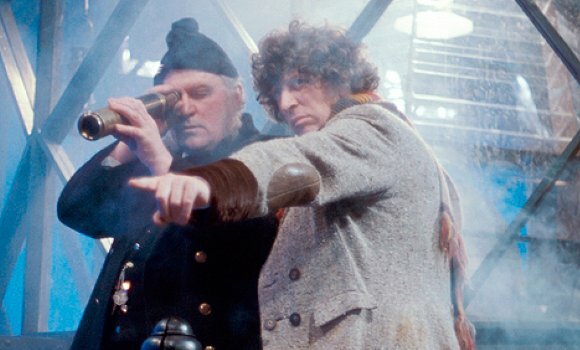 The final story of 1977 was 'The Sunmakers', written by outgoing script editor Robert Holmes. The story is about a company that uses extreme forms of taxation to control the people of the planet Pluto. This company are able to enforce the taxes because the built the suns that now surround Pluto and allow people to live on the planet. Naturally it's up to the Doctor, Leela and K9 to unite the people and bring down the evil regime. Incidentally, 'The Sunmakers' sees a guest appearance by the actor Michael Keating who, about three weeks after the final episode of 'The Sunmakers' was transmitted, would be seen again in the first episode of 'Blake's 7' - the closest that Doctor Who ever got to having a sister show back in the late 70s - as series regular Vila. Nothing of note this year. Once again there were a large number of books published this year. 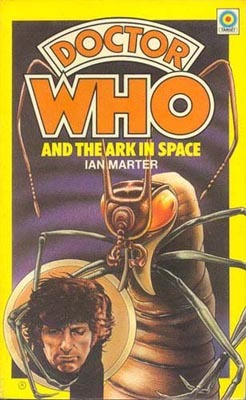 As far as the novelisations were concerned, there was only one month that didn't see a new book published. Of those eleven, 8 were written by the ever-reliable Terrance Dicks. 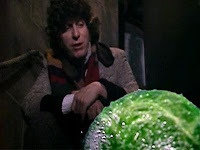 Two, 'The Seeds of Doom' and 'Masque of Mandragora' were written by current Doctor Who producer Phillip Hinchcliffe while 'The Ark in Space' was written by Ian Marter who, if you recall had played the role of companion Harry Sullivan in 1974-1975. 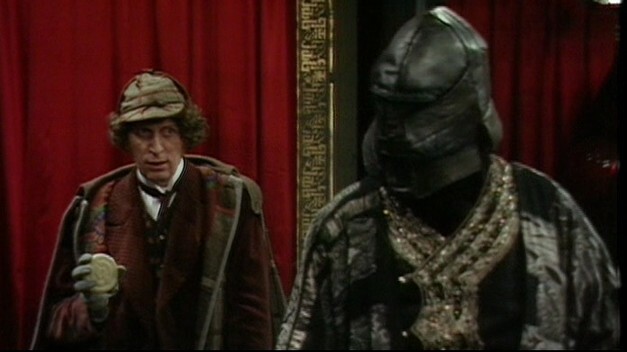 For those keeping track, the eight written by Dicks were 'Carnival of Monsters', 'The Dalek Invasion of Earth', 'The Claws of Axos', 'The Brain of Morbius', 'Planet of Evil', 'The Mutants', 'The Deadly Assassin' and 'The Talons of Weng-Chiang'. 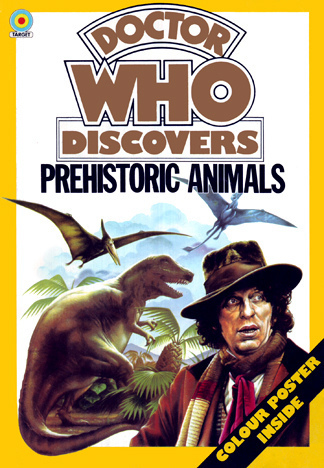 Aside from the standard Doctor Who and Dalek Annuals, 1977 also saw the publication of the 'Doctor Who Discovers...' series of books. Like the Dinosaur book last year, these were educational books on a variety of different subjects. So we had Doctor Who Discovers... Early Man, Prehistoric Animals and Space Travel in the three books that were published this year. 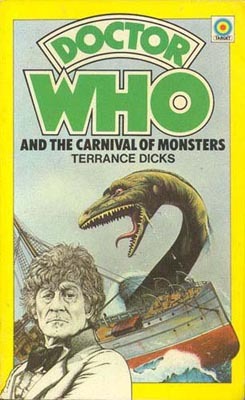 Finally, also published this year was a Second Doctor Who Monster Book and a Doctor Who Omnibus which, like the Dalek Omnibus last year, contained reprints of novelisations. In this case the reprints were 'The Space War' (aka 'Frontier in Space'), 'The Web of Fear' and 'Revenge of the Cybermen'. Leela made her TV Comic strip debut in July of this year in a story entitled the 'The Orb'. Perhaps surprisingly, her character here remained remarkably faithful to her TV counterpart: she wore skins, carried a knife and was quite violent. Perhaps because of this, she was destined not to last long in the strip and was gone just six months later with no explanation for the absence given. Also published by TV Comic this year was the Doctor Who Winter Special (just a guess but I'm assuming it was published in time for Christmas). The Special featured several comic strips that had previously been published in either TV Comic or Countdown/TV Action a few years earlier. However, the art was 'doctored' (pun not intended) to replace images of previous Doctors with that of the Fourth. This was a practice that would occur a lot more in the comic strip proper over the next couple of years.